Several dozen residents of the regional center have signed a collective letter to the Council of Ministers in which they ask officials to change the decision 881 of 10.07.2009 of Vitebsk Executive Committee, which regulates the rules of applications to authorities when applying for a street protest. 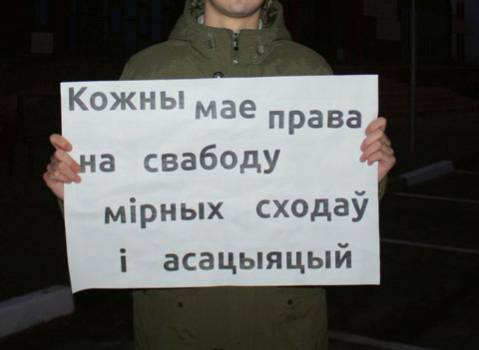 Vitebsk citizens also requested that the Council of Ministers would initiate a petition to the Constitutional Court to verify the compliance of this document with the Constitution. “Since the Executive Committee adopted the decision 881, activists were not given a single permission to a picket or a rally. And not only in Vitebsk, but also in Orsha, Hlybokaye and other regions. Indeed, the recent decisions of regional executive committees were rewritten from the sample of Vitebsk one: everywhere it is required that along with the application for an action the applicants should enter into contracts with militia, public utilities and medical care establishments. But these structures are avoiding signing contracts in any way possible. For example, the town’s policlinics periodically answers that 2-3 weeks before a planned action they are expecting an outbreak of some seasonal disease, and exactly on this special day. So, they say, that there are no free workers and they can’t cooperate with us”. By the way, the militia, when refusing to enter into contracts with applicants, primarily is referring to the legislation, but not to the decision of local authorities. Militia departments write that they will conclude contracts only when there will be a decision of the local administration, as required by law. And not vice versa, as recorded in the executive committee’s decision. “I have studied 40 decisions of local authorities which order citizens to conclude contract in advance, before actions, have not yet received a permission form them. And only 28 decisions comply with the legislation and do not demand from citizens any additional actions. Thus, in most regions violation of citizens’ right to publicly express their views through peaceful assembly takes place”. Vitebsk activists have first appealed to the Council of Ministers, for them to order to make amendments to the decision of the executive committee. Previous attempts to initiate this process were unsuccessful: all instances responded the activists that the decision have passed legal expertise, has been approved and recognized to be perfect.